For bowel calm extra strength S. boulardii is a natural probiotic food supplement and not a medicine. It is a completely natural probiotic food supplement offering support for bowel health and comfort. Saccharomyces boulardii Unique28 – an exceptional probiotic which is sold widely in the US, Scandinavia, Germany & France. S. boulardii has undergone extensive clinical research proving its ability to flush out pathogenic bacteria such as E. coli and Salmonella and its therapeutic benefits against diarrhoea. 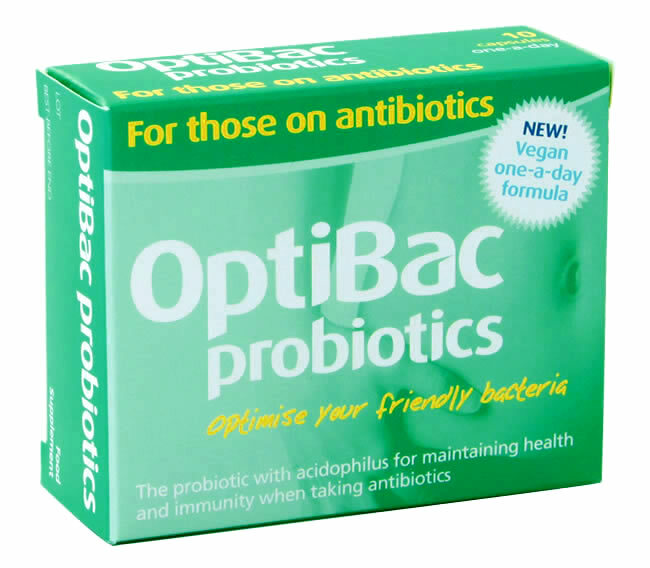 OptiBac Probiotics guarantees 5 billion live micro-organisms per vegetarian capsule until the best before date. – Take one to two capsules depending on severity of symptoms and up to six capsules daily or as professionally directed. – For young children or any patient unable to swallow capsules, the content of the capsules can be mixed with a cold meal or beverage. The normal balance of friendly bacteria in our gut is fragile and can easily be disturbed by factors such as stress, diet, ageing, and medication (e.g. antibiotics). For those on antibiotics promotes a healthy balance of good bacteria, thereby supporting health, digestion and immunity for patients taking antibiotics. Lactobacillus rhamnosus Rosell-11 – a natural component of the friendly bacteria in the intestines; this species is one of the most studied in the probiotic world. L. rhamnosus Rosell-11 has been proven to resist bile and gastric acidity over pH 3 – therefore if taken at mealtimes (when pH is around 4), it will pass through the stomach without being damaged. L. rhamnosus Rosell-11 is able to bind strongly to the intestinal cells and helps maintain a strong immune system. Lactobacillus acidophilus Rosell-52 – a natural resident of the intestinal microflora; this strain of friendly bacteria has been well studied to survive the gastric acids and bile salts expected at mealtimes and to reach the intestines without damage. In addition, L. acidophilus Rosell-52 can adhere to the cell wall lining of the intestines and exert beneficial effects in terms of inhibiting intestinal pathogens and supporting immune cells. OptiBac Probiotics guarantees 4 billion live micro-organisms per capsule until the best before date. For those on antibiotics is suitable for vegetarians, vegans, during pregnancy and is free from artificial colours, gluten and yeast. – Take one capsule daily with food until antibiotics course is finished and preferably one week after or as professionally directed. 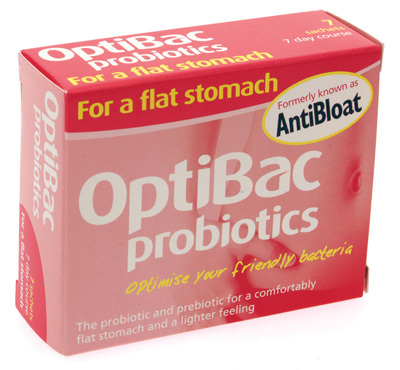 – Continue taking OptiBac Probiotics For those on antibiotics until 10 capsule pack is completed, and add a second pack if the antibiotic treatment lasts more than one week. Filler: potato starch; Vegan capsule: hydroxypropyl methylcellulose, titanium dioxide; Probiotic culture: (Lactobacillus rhamnosus Rosell-11, and Lactobacillus acidophilus Rosell-52); anticaking agent: magnesium stearate; antioxidant: ascorbic acid. Daily probiotic support means normalising a healthy balance of friendly bacteria throughout the entire intestinal tract. 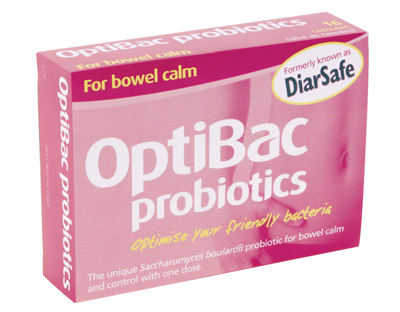 With OptiBac Probiotics, the different strains (or types) of friendly bacteria along with the prebiotics have been specifically chosen for the different clinically proven health benefits they convey in the different parts of the small and large (colon) intestine. 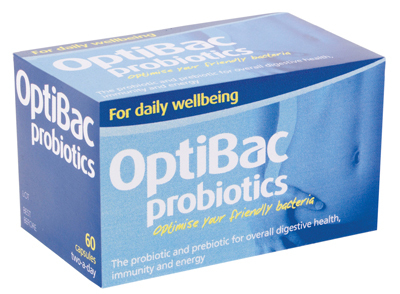 OptiBac Probiotics For daily wellbeing provides a high potency and select variety of well researched and documented probiotic strains. In addition For daily wellbeing is free from sugars, fats, preservatives or colourings that may be found in some daily probiotic foods and drinks. Lactobacilli Strains: Lactobacillus rhamnosus Rosell-11 and Lactobacillus acidophilus Rosell-52 are among the most well researched and documented species of friendly bacteria naturally resident in the human gut. These strains have been well studied to survive the gastric acids and bile salts expected at mealtimes and to reach the intestines without damage where they colonise well, support immune cells and create a healthy lactic acid environment that limits survival of harmful bacteria (e.g. Streptococus aureus, Enterobacter cloacae, Listeria monocytogenes). Bifidobacteria Strains: Bifidobacterium longum Rosell-175, Bifidobacterium breve Rosell-70 and Bifidobacterium bifidum Rosell-71 colonise primarily in the large intestine (or colon). In this region they promote the production of antibodies, support the body against toxins and inhibit the development of undesirable bacteria by competitively excluding their attachment to the intestinal wall lining. In addition, a healthy balance of bifidobacteria supports the intestines in assisting transit and optimizing a healthy frequency and regularity of bowel movements. Lactococcus lactis Rosell-1058: This strain is obtained from the kefir culture and is renowned for the antimicrobial benefits in supporting the body against undesirable harmful bacteria and some fungi. Prebiotics: The non-digestible FOS (fructooligosaccharides) safely make their way to the large intestine (colon) where they act as a food source to stimulate growth of the bifidobacteria. The symbiotic relationship between bifidobacteria and prebiotics in the colon has a great impact on supporting intestinal health and wellbeing. OptiBac Probiotics guarantees 2.5 billion live micro-organisms per vegetarian capsule until the best before date. – Take two capsules daily with food, preferably with breakfast, or as professionally directed. Potato starch, Fructooligosaccharides (FOS), Probiotic culture (Lactobacillus rhamnosus Rosell-11, Lactobacillus acidophilus Rosell-52, Bifidobacterium longum Rosell-175, Lactococcus lactis Rosell-1058, Bifidobacterium breve Rosell-70, Bifidobacterium bifidum Rosell-71), hydroxypropyl methylcellulose, magnesium stearate, ascorbic acid.